On the day before the ING New York City Marathon, New York Road Runners holds a 5K that takes you through the streets of Midtown up to Central Park and through the marathon finish line. As soon as I saw the route, I wanted to run this race. 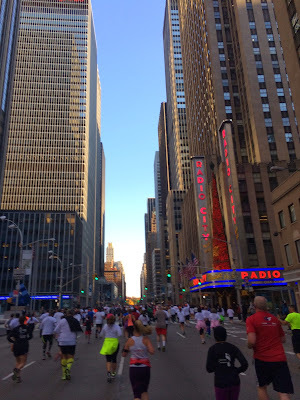 My favorite part of the NYC Half was running through Midtown, and getting to pass under the marathon finish line would be an awesome preview of what so many of my friends would be doing the next day. The race is a bit expensive ($40 I think? ), but when you consider how many major streets are shut down for the race, including part of 42nd Street, I considered it fair. We were lucky, and after a couple of gloomy days last week, Saturday was gorgeous running weather. High 50s and sunny. 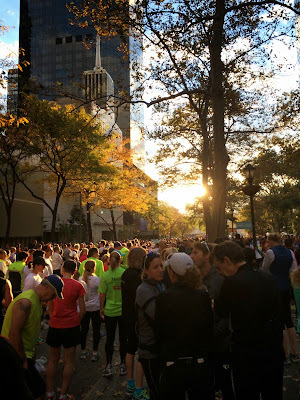 I was surprised by how many runners were in long sleeves and tights! 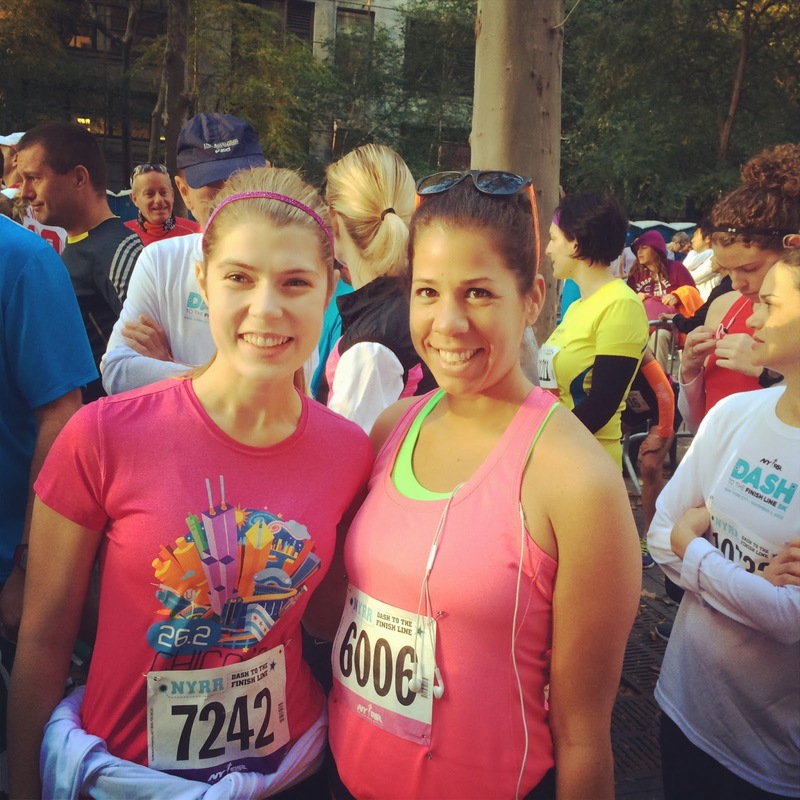 I wore shorts and a tee shirt and ended up feeling warm during the race (but I also "run hot"). 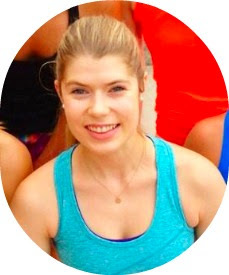 HUGE thanks to Gianna, who made running the race possible! 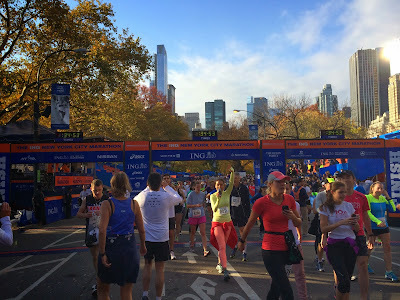 The only place you could pick up your bib was at the NYC Marathon Expo at Javits Center, which is on the far west side of Midtown, about 4 long avenue blocks from the subway, and the hours were 10 AM - 7 PM Thursday and Friday. Since I work in Midtown East and a typical day runs from 9 AM to 7 or 8 PM, there was no way I could have gotten my bib if not for Gianna. She volunteered to pick it up for me while picking up her own, which was so helpful. Thanks so much, Gianna! We met up at the start line around 8 AM and chatted about our "race strategies." Neither one of us was out to PR -- I ran my first marathon three weeks ago and she was running NYC the next day, so it would have been a bad idea for either of us to race this. I decided my goal was going to be to beat my previous New York Road Runners pace PR (an 8:55) and Gianna was using the race as a shakeout run before the marathon. I think a lot of runners were doing the same thing, since the race was surprisingly crowded. It's a great option if families travel in from out of town to cheer at the marathon and want something fun to do the day before. I saw a lot of people who seemed to be in groups running together. 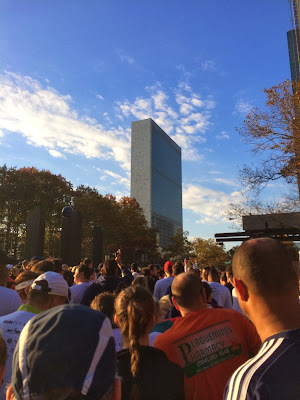 The race course starts you off right in front of the UN building on the East River. Is it shocking to say that I'd never been there? I've seen it in many movies (notably, the 1966 Batman movie, which was a favorite of mine when I was an oh-so-cool little kid), so it made the start line extra fun. As soon as we took off, I realized that this was not a race to "race." 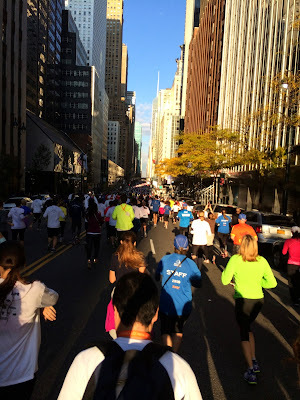 The course was incredibly packed, despite taking up all of 42nd Street. I think that for a lot of runners visiting from out of town, they use this race as a fun run pre-marathon to check out the city and the sights. Lots of runners had flags painted on their faces (or hanging down their backs) and I saw so many people stopping in the middle of the road to take pictures. I couldn't be annoyed, though, because how can you hate on so much enthusiasm for your city? This is a race to be enjoyed. You run by iconic sites like the UN building, Grand Central Station, Rockefeller Center, and Radio City Music Hall. I loved seeing so many people having fun on the streets of Manhattan. And of course, the race concludes with the finish line of the NYC Marathon. I finished in 26:58. Not a PR by a long shot, but I did chop 13 seconds off my NYRR pace PR (from 8:55 to 8:42 average pace). Woot! This race is such a fun celebration of running and NYC, and even better, it's one that doesn't require you to train for a marathon! Did you run a race this weekend? 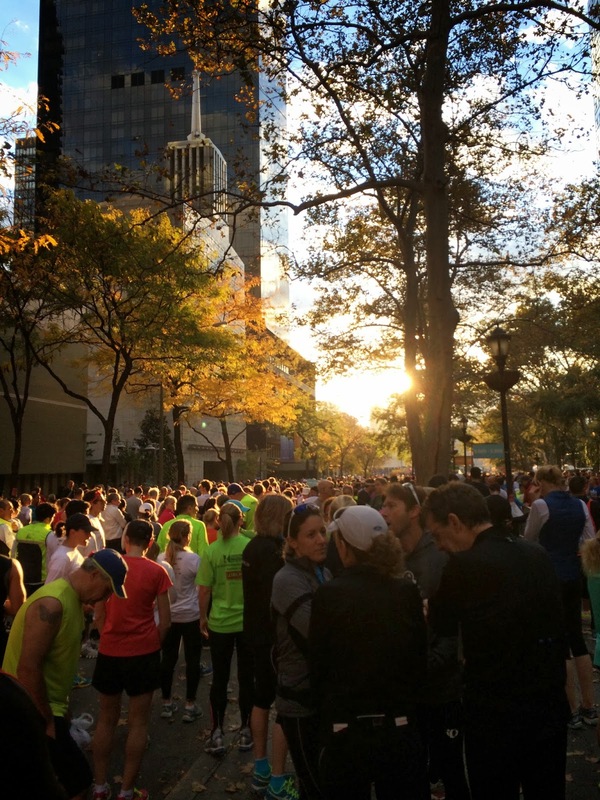 Do you like races that celebrate the city they're in? Not to mention seeing you on the course the next day. twice in one weekend! woo! I'm so glad you got to run the marathon this year! The race is a lot of fun, so I'd run it next year if you can. But understood, it's a trek to get to the expo AND this race AND the marathon!